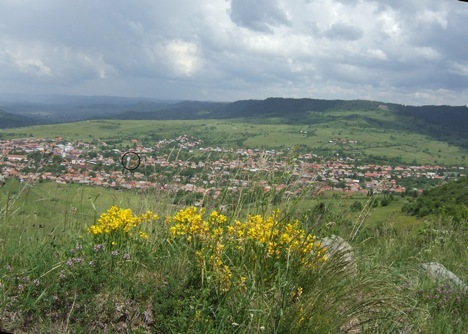 The Village of Korond, Transylvania Our partner church (circled) is in the village of Korond (Hungarian) or Corund (Romanian) on the eastern side of Transylvania, in Romania. According to historians, a nomadic tribe named the Huns dwelling near the Caspian Sea in the 400s invaded the Roman province of Pannonia, led by Attila. After his death in 454, many of his followers retreated, leaving behind the name Hun, which became Hungary. Although no one is sure, a modern hypothesis is that thousands of the Huns became separated from the main body and settled in the mountains of eastern Transylvania. Today their descendants bear the name Székely, a Transylvanian subgroup of the Hungarians. The name of Korond first appeared in 1333 in Catholic Church documents. Geologists estimate that salt deposits formed in the area about six million years ago. Economically salt was the most important product of medieval Transylvania. Those Székely who settled in Korond, took up farming, and provided support for those who mined and traded salt. The Praid Salt mine, one of the biggest salt mines in Europe, is 11 km north of Korond. Today the first level of the mine is dedicated to tourists. The first written mention of pottery manufacturing in the village is from 1613. At first potters took their works to sell at nearby fairs. Gradually they expanded their market, and by the mid-19th century, fifty potters were selling pottery to all of Transylvania. In the 20th century, the development of tourism stimulated the advancement of the manufacturing of pottery. Today Ceramic pottery from Korond is known abroad, and the market has expanded considerably. 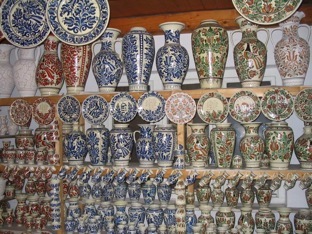 Many shops selling pottery and other Hungarian folk art line the main street. Tourist buses frequently visit the village. Korond has a population of about 6,000 of which about 5,780 are ethnic Hungarians. There are about twenty Romanians in the village, and about 200 gypsies.